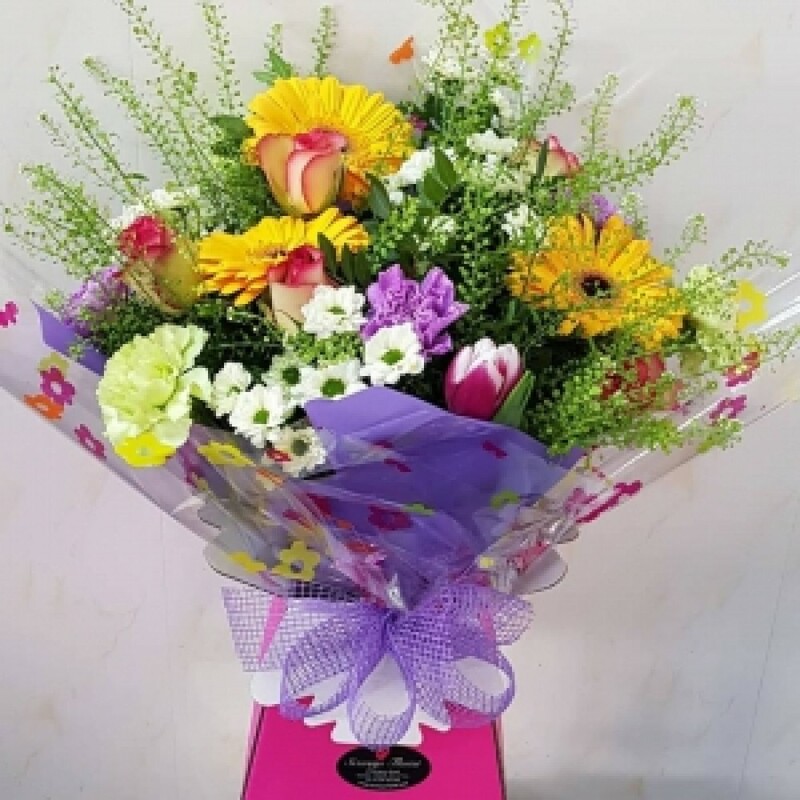 Leave it to us we'll make up a selection of beautiful blooms they will be tied in place gift wrapped and be in water they may be in a box, flower bag or a stem gem vase which is a reusable recyclable container. If there are any flowers you really do not wish to be included e,g lilies then simply state in the comment box. n.b. the picture is one of just a recent bouquet sent out the flowers may look quite different but will be beautiful, you can also put a note in the comment box if there are any colours you would prefer or would not like us to use also and depending on notice we will do our best to accommodate, we will also go by any notes made for occasion or the message to what we feel would be appropriate. We are situated in Gorslas near Cross Hands Carmarthenshire we deliver to Llanelli, Llandeilo, Ammanford and Carmarthen and lots of villages in between e.g Tumble, Penygroes, Pontyberem if you are not familiar with the area and you'd like them delivered please feel free telephone or e mail us to check it's in our delivery area, we cannot always do same day delivery we do always try but we recommend pre ordering or very early morning, we can sometimes do later in the day deliveries if local if driver has already left but unfortunetly not further away addresses and not rural in the winter months as cannot see these properties in the dark, we also cannot always do same day deliveries on the main occasions like Valentine's day or Mother's day simply because of increased volume of delivery orders so pre booking is essential on these days.